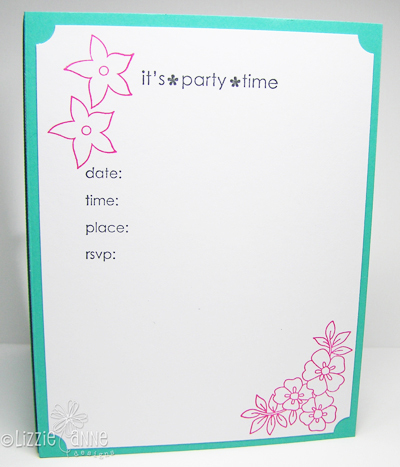 Summertime is such a great time of the year for Luau-type parties, so that is what inspired this invitation. I used the new In Colors from SU, and the flowers are embossed with white embossing powder. I hope you like it! You can see step-by-step details at the Lizzie Anne Designs POTM section, as well as lots of other fabulous projects to try out. Adorable card, Rose Ann! She's adorable! sooo stinkin' cute Rose Ann!!! So fun and sweet. Love your fab colors. 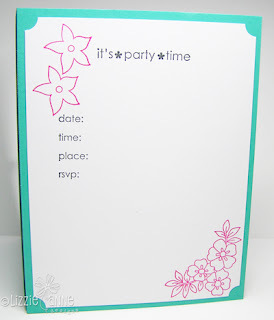 Oh your invitation is so adorable1 I love the colors you used, and what a cute image! so cute. love the background. not sure if you have noticed but i have a little addiction to white embossing powder! lol. fun colors too! She is adorable. Love the color palette here too! Awesome color combo!! So eye catching! Love your inside too! Your background is sensational! And I love the sentiment on the surfboard. Is that your handwriting? Adorable Rose Ann!! Love this color combo. I would never think of pairing those two colors together, but they are fabulous!!! What an inspiration!! Great card. I love the new colors. I went to a SU workshop last night. Bermuda Bay and Melon Mambo are super and you put them together in a wonderful card. This is adorable, Rose Ann. . I LOVE it! Adorable invite! I would definitely come!! Hi RoseAnn! What a cute invitation! Summer at its best! Love your pictures from your stay in Ludington...We have not been there in years! 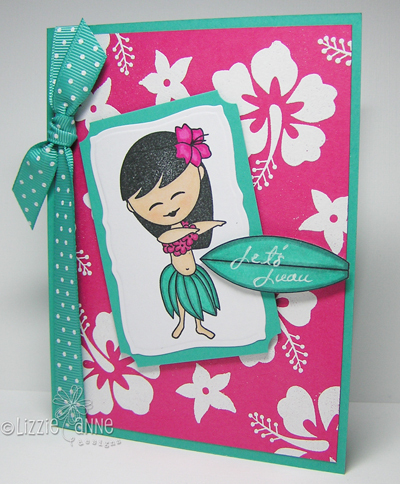 Fun luau card Rose Ann! Love the great new SU! colors you used. They are perfect for that sweet image and bg! I can't wait to get my hands on the new In Color. Your little Hula girl is so adorable! Oh this is so adorable! Those embossed flowers make the perfect background for the hawaiian girl! Ooooh! LOVe this Rose Ann! What GORGEOUS colors and I LOVE this little sweetie!! What a cute invitation! I love that bright color combo! Gosh, I thought maybe that was some new designer paper! Very cute and so well made, Rose Ann! Oh, I love the fun colors!